The Caribou High School Vikings celebrate their victory over Cape Elizabeth High School in the boys Class B state championship basketball game at the Cross Insurance Arena in Portland on Saturday. 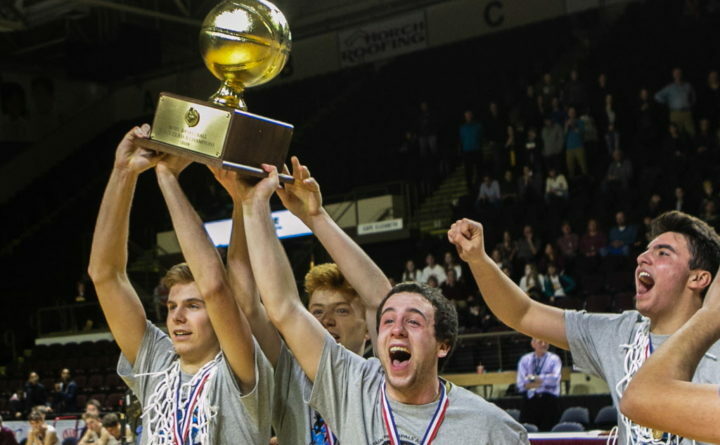 PORTLAND, Maine — Caribou High School may only win a state championship in boys basketball every 50 years, but the Vikings sure know how to do it in style. Five decades removed from Mike Thurston’s shot from beyond the midcourt stripe at the Bangor Auditorium to lift Caribou to the 1969 Class LL state crown, a youthful band of Vikings under a first-year head coach took on their tallest challenge of the winter and outlasted Cape Elizabeth 49-47 in double overtime in Saturday’s Class B title game at the Cross Insurance Arena. “I don’t think any of us saw this coming from the beginning of the season,” said Caribou junior forward Parker Deprey. “We came off a 6-12 season last year, and nobody was counting on us to do anything this year. Caribou High School's Austin Findlen and Cape Elizabeth High School's Nathan Mullen fight for the ball in overtime during the boys Class B state championship basketball game at the Cross Insurance Arena in Portland on Saturday. 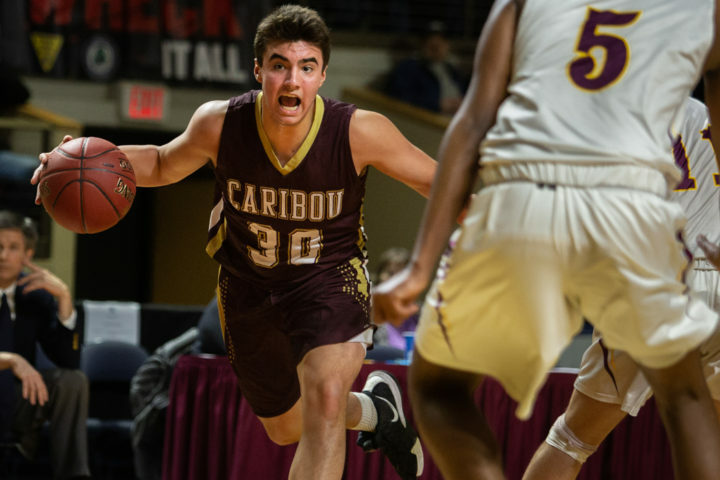 Austin Findlen, the lone senior starter for Caribou, scored a team-high 13 points while Duprey finished with 12 and junior guard Alex Bouchard added nine for the 19-3 Vikings, who rebounded from a 3-3 start to win their last 16 games. 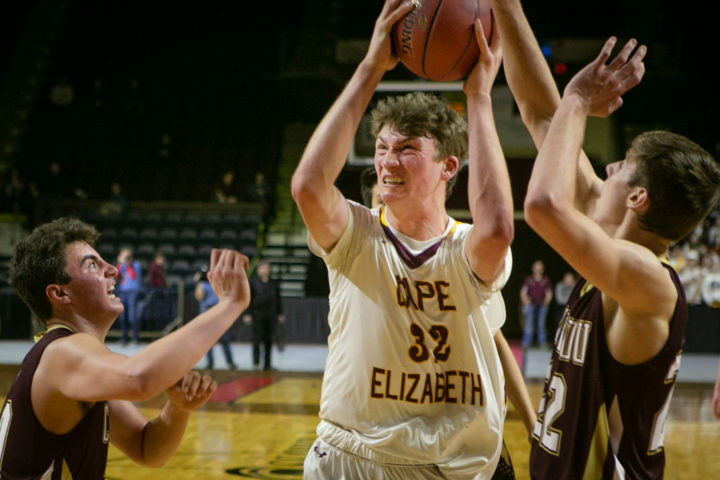 Cape Elizabeth (14-8) got a game-high 18 points and 15 rebounds from 6-foot-9 senior center Andrew Hartel before he fouled out with with 2:17 left in the second overtime. Cape Elizabeth High School's Andrew Hartel takes the ball to the hoop while guarded by Caribou High School's Sawyer Deprey (left) and Parker Deprey in the boys Class B state championship basketball game at the Cross Insurance Arena in Portland on Saturday. “Give [Caribou] credit for the defensive pressure they put on but we didn’t get the ball reversed enough to both sides of the floor to make them adjust their defense and give [Hartel] more space inside,” said Cape coach Jim Ray, whose team sought its first gold ball since 2015. 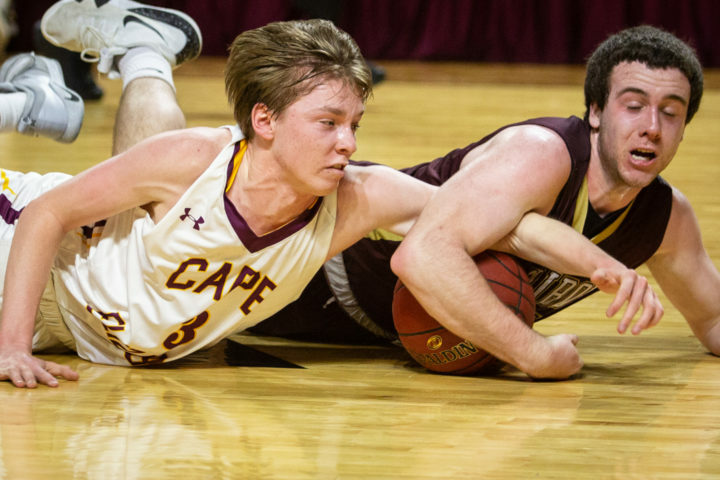 Making life more difficult for Cape’s top weapon was Caribou’s youngest starter, 6-foot sophomore Sawyer Duprey, who helped limit Hartel to 12 shots. “I think Sawyer had the game of his life defensively,” Corrigan said. 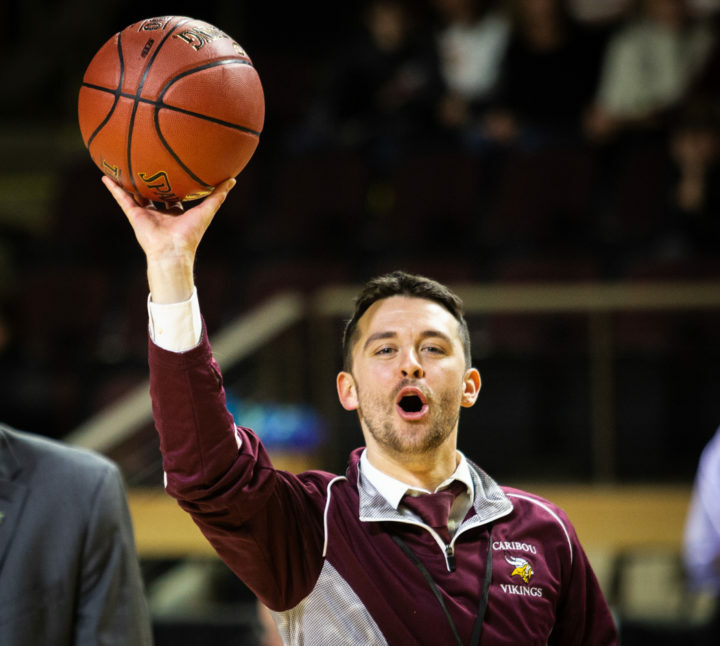 Caribou High School Head Coach Kyle Corrigan holds the game ball aloft after his team's win in the the boys Class B state championship basketball game at the Cross Insurance Arena in Portland on Saturday. This game was tied 42-42 at the end of regulation and 47-47 after the first overtime. Caribou got the only points of the second overtime on a free throw by Bouchard with 2:36 left and one by Isaac Marker with 19.8 seconds to play. Cape had one last chance to tie or take the lead, inbounding the ball from the left wing with 5.4 seconds left. Nate Mullen inbounded the ball to Amaniel Hagos, who passed it across the court to Tanner Carpenter. Carpenter’s 3-point bid hit the front of the rim, and Bouchard knocked the ball into the backcourt to set off a County-wide celebration. Cape Elizabeth High School's Nathan Mullen drives through Caribou High School defenders in the boys Class B state championship basketball game at the Cross Insurance Arena in Portland on Saturday. Cape Elizabeth dominated the backboards early, outrebounding Caribou 10-2 while building a 9-2 lead four minutes into the contest. 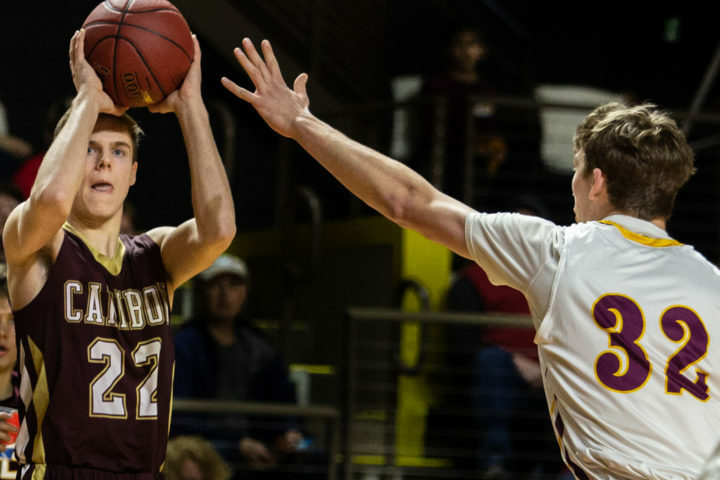 But a timeout served to settle the Vikings, and after Sawyer Deprey drove past Hartel for a layup and older brother Parker Deprey buried a 3-pointer, Caribou was into the flow of its game. “We were giving them way too many offensive rebounds,” said Corrigan. “We had focused on that in practice all week but weren’t executing the way we wanted to. Caribou High School's Sawyer Deprey starts a play against Cape Elizabeth High School in the boys Class B state championship basketball game at the Cross Insurance Arena in Portland on Saturday. Caribou took its first lead at 16-15 on a 3-pointer by Marker with 6:00 left in the first half after Sawyer Deprey rebounded his own miss, and another 3-pointer by freshman Michael Brigham gave the Vikings a 21-18 edge. Cape held Caribou scoreless over the final two minutes of the half, and a coast-to-coast drive and a pullup jumper by Mullen gave the South champs a 22-21 edge at the break. Hartel drew his first three fouls in the third quarter, which ended in a 34-34 stalemate, then picked up his fourth and went to the bench with Caribou holding a 36-35 lead with 4:41 left in regulation. The Vikings extended their lead to 41-35 on two Findlen free throws with 1:26 remaining, but Cape forged a 42-42 tie upon Hartel’s return as he converted a reverse layup and two free throws to go with a tying 3-pointer by Carpenter with 19 seconds left. 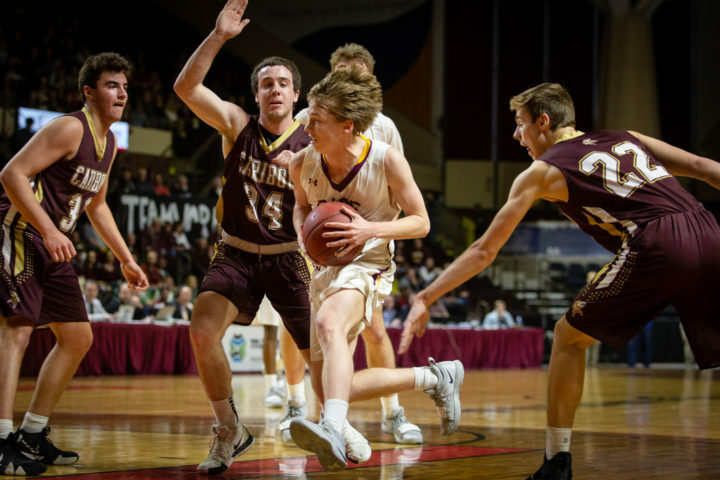 Caribou had one last chance to win in regulation, but Cape Elizabeth tipped away a Vikings inbounding pass and by the time Parker Deprey recovered the ball he was left with a desperation shot from 40 feet at the buzzer. This time the miracle shot didn’t fall, but the ultimate result was the same. Caribou High School's Parker Deprey shoots the ball while guarded by Cape Elizabeth High School's Andrew Hartel in the boys Class B state championship basketball game at the Cross Insurance Arena in Portland on Saturday. 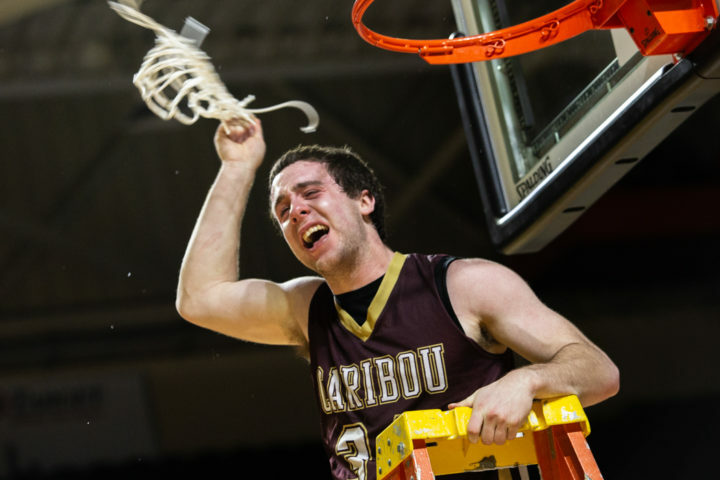 Caribou High School's Austin Findlen celebrates his team's win in the boys Class B state championship basketball game at the Cross Insurance Arena in Portland on Saturday. 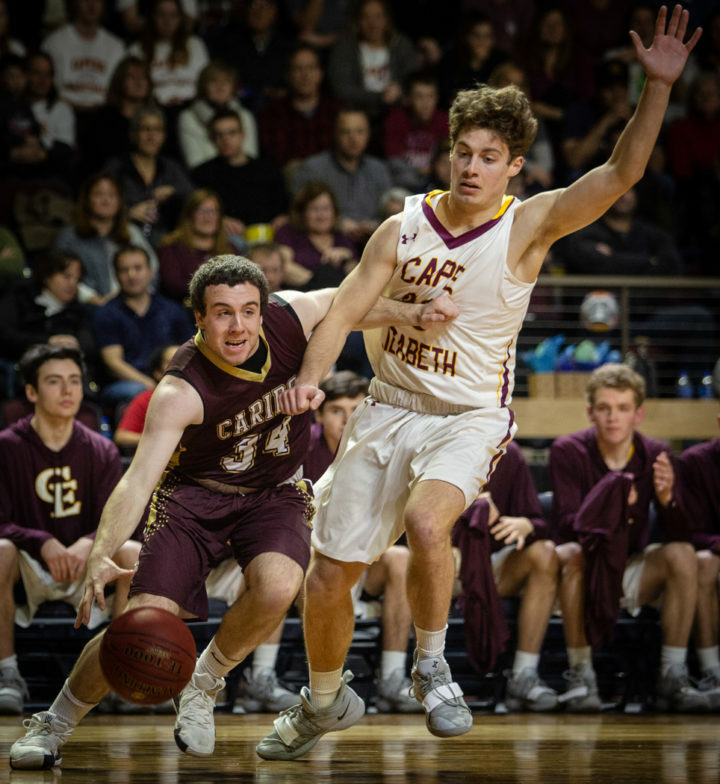 Caribou High School's Austin Findlen drives around Cape Elizabeth High School's Matt Conley in the boys Class B state championship basketball game at the Cross Insurance Arena in Portland on Saturday. 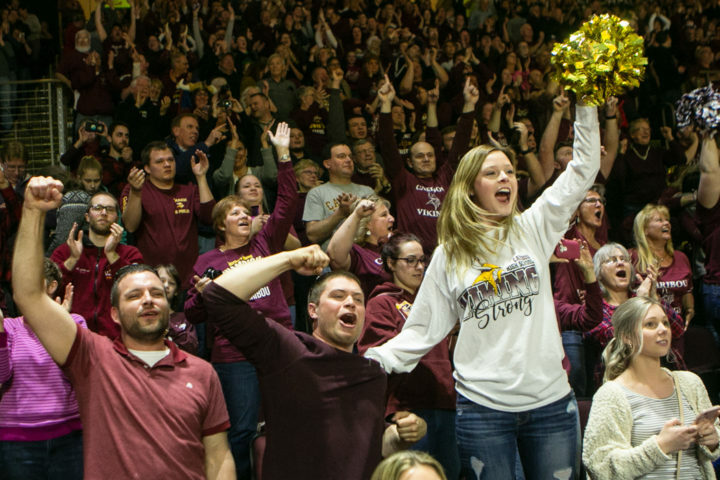 Caribou High School fans cheer their team on in the boys Class B state championship basketball game at the Cross Insurance Arena in Portland on Saturday.